When I started Robins Plumbing it wasn’t because the Phoenix area needed another plumber, I started Robins Plumbing because Phoenix needed a plumber that they could trust. Our mission statement since opening our doors back in 2004 has been. Finally, a Plumber YOU Can Trust 24 Hours a Day. When I created my vision for Robins Plumbing it was to bring values into the plumbing profession. Finally, a plumber YOU can trust. For 14 years we have been honored to be the plumbing company that our clients can trust 24 hours a day. After 14 years in business, we have grown a lot. I am thrilled to announce our new company mission statement. A Higher Level of Service. After many nights pondering who we are and what sets us apart, several glasses of red wine later our new mission statement came accidentally. I shared on my personal Facebook page an experience we’d had as a company that day. A woman in NE Scottsdale had been without sewage for two weeks due to a broken sewer line. I could hear her 9-month-old baby in her arms, and her husband is taking their toddler to a neighbors house to use the restroom. She called around 6 pm and shared how she’d been trying to find someone to come out and fix their problem, and she had been given the run around, others didn’t show up, some gave her a bid and then didn’t come to do the work, others just plain tried to rip her off. She had been venting to her neighbor and friend, and her friend recommended giving Robins Plumbing a call. The next morning, which was Saturday we were out running a cable through the line to try to alleviate the emergency and confirm the diagnosis. We were there Monday morning with a backhoe and a team, and that night she had running sewer. The interesting thing to me was that we didn’t do anything we don’t normally do. The situation was our normal day to day operations. We always do our absolute best to provide a higher level of service. Over the past 14 years everything we have worked toward and developed in our company’s culture, our system of values translated to a simple result, a higher level of service. Our clients have come to depend on our values as a part of their service. 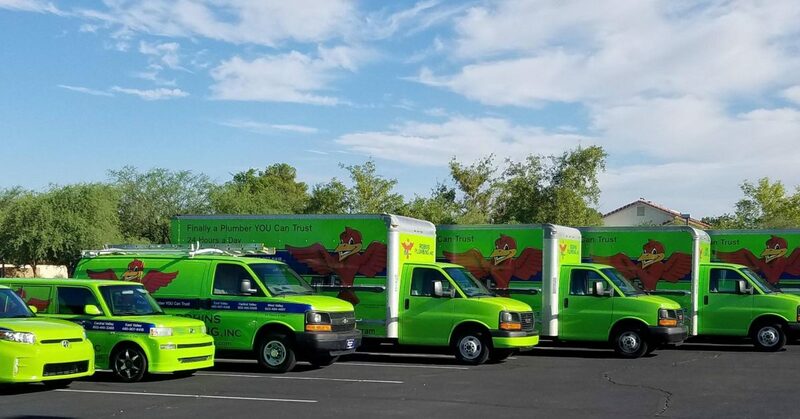 We are honored that so many of our clients proudly refer us to their friends and family and even take photos and share them on social media when they see our big green vans going through their neighborhoods. We have become so much more as a company than just trust, and that is why we are evolving and sharing the result you can expect when you choose Robins Plumbing to be your plumber. A higher level of service, every single time. How are we better than our competitors, we care about the service we provide. By providing a higher level of service not only does our client benefit but we as a team benefit. By providing a higher level of service, we feel amazing at the result we have created. In a world where service is dying and being replaced with keypads and technology – more than ever epic service is what 2 we crave as clients. With service positions being replaced by technology, quality service is a breath of fresh air. What does a higher level of service mean? What can you expect as our commitment to you to provide a higher level of service? You can expect 12 company values as a part of every service. Our company values are Trust, Loyalty, Honesty, Respect, Growth, Education, Integrity, Fun, Team Work, Dependability, Family and Appreciation. You can expect that everything we do and every decision we make is based around these 12 non-negotiable values. When we started Robins Plumbing back in 2004, it was because we had the vision to lead the plumbing profession and raise the bar on service by adding what seemed like common sense to us – TRUST. You can trust Robins Plumbing to do the right thing we base all of our decisions on what would be the trustworthy choice, how would we want our family and friends treated? Dependability is incredibly important, not just for our clients but us as team members. As a team, each one of us depends on another, and our clients depend on us as well. You can depend on us to be there, and you can depend on us to communicate and to provide incredible service at a great value. Teamwork makes the dream work. When we think of teamwork, we think DzAll for one and one for all. Everyone at Robins Plumbing plays an integral and important role in the success of our company. Each team member knows that they bring incredible value and expertise to the company and to our clients no job is more important than another, because like a puzzle, it takes all different pieces to complete the picture. One team members’ success and growth is all team members’ success and growth. Weekly at Robins Plumbing we have a meeting and cover product education as well as leadership skills and team building skills. Robins Plumbing is constantly striving to learn and increase our skills so that we can share that knowledge with our clients. Our team members love to educate our clients so that they can make informed decisions about their homes and businesses. Our team members educate each other about new products, new ideas, and the best way to handle different situations in the field. 3 services that you do need and that are important to your home or business. Loyalty is incredibly important to Robins Plumbing, loyalty to both our clients and to each other as a team. Trust and loyalty cannot be bought, they have to be earned, and each day we strive to earn the loyalty and respect of our clients and our team members. We are the home of the Loyalty Program. The Loyalty program rewards our clients for their loyalty by giving back. Our Loyalty Program members receive updates on special promotions and discounts offered only to our members and 25% off their 5th service up to $200.00! At Robins Plumbing we are passionate about growth. Growth in our team members and growth for our team members. Personal growth and self-development are a part of our culture. Investing in our team members, who are our greatest asset, helps to create an atmosphere of learning, fun, and teamwork. We love creating new opportunities for our team members through education and growth. Integrity for Robins Plumbing is clearly defined as doing the right thing when no one is watching. It is one thing to do the right thing when you have an audience it is another to do the right thing when no one but you will ever know about it. We have a firm foundation built on integrity, and our reputation as a company that can be trusted is built on doing the right thing even when no one knows. Our mission is to be the plumbing company you can trust to provide a higher level of service. Our family will treat you with respect and honesty. You can depend on our teamwork to solve your plumbing issue and communicate with you through the entire process while appreciating and valuing your time. With fun and integrity, we will educate you, so you can make informed decisions regarding your plumbing repair. Our team’s dedication to continued personal and professional growth will serve our clients long-term, creating a loyal community of clients that become family.